There’s nothing quite like becoming a parent to prompt you to evaluate your life’s purpose. At the end of 2014, Luke and I each sat down to reflect on our hopes, intentions, and goals for the coming year. As we stared down our entrance into the world of parenthood, we each found ourselves asking the question: what is it that I really want out of life? How can I effectively contribute to this world, and to our family, in a meaningful way? In addition to talking and praying about these questions, we decided to turn to some outside sources to help us evaluate our unique strengths. We had heard positive things about the StrengthsFinder 2.0 test and book and decided to incorporate it into our self-evaluation process. 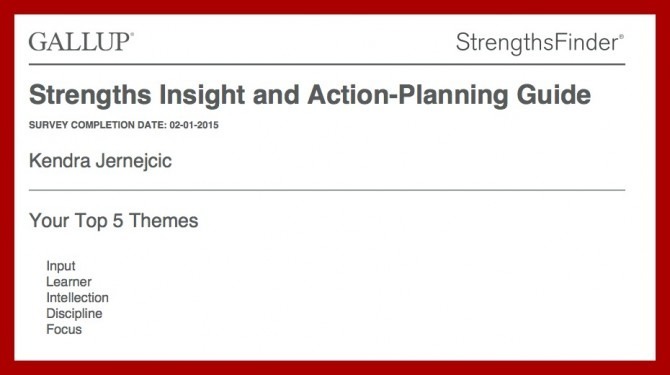 The StrengthsFinder program has its beginnings in 1998 when a team of scientists set out with a goal of starting “a global conversation about what’s right with people.” Using information gleaned from a 40-year study of human strengths, the team identified 34 common talents and created an online assessment to help people identify their unique areas of strength. Whereas most self-improvement programs focus on overcoming weaknesses, the aim of StrengthsFinder was to guide people in developing their core talents and maximizing their innate strengths. 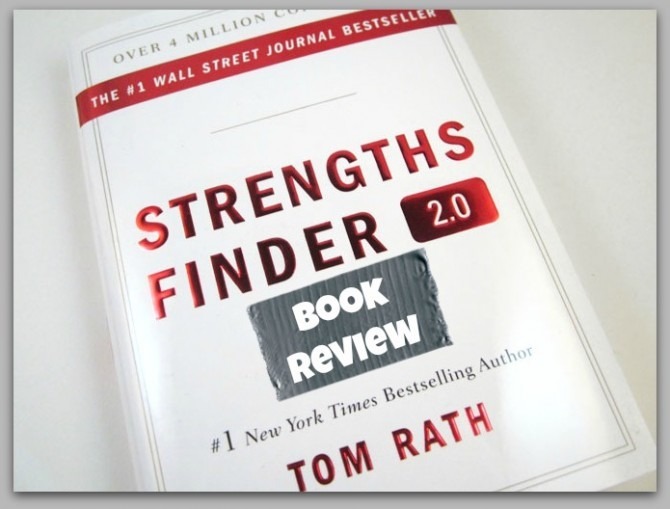 The initial version of the assessment was released in 2001 with the management book Now, Discover Your Strengths, and in 2007 an expanded version of the assessment and application strategies was launched as StrengthsFinder 2.0. This updated book begins with a brief introduction to the program and and an explanation of its premise that an individual’s time and energies are best spent developing existing talent, as opposed to focusing on the amelioration of personal shortcomings. A majority of the book is dedicated to elaborating upon each of the 34 “themes,” with each theme offering personal anecdotes, ideas for maximizing the talents associated with the strength, and suggestions for interacting with individuals possessing that particular strength. While this material is interesting (I enjoyed reading each theme and trying to identify people in my life who might possess the various strengths), the book’s real value lies in the individual assessment that can only be taken using the access code that comes with the purchase of the book. Upon completion of the online assessment, you receive a Strengths Discovery and Action-Planning Guide that identifies your five top themes and offers suggestions for building upon these strengths. I’ve always been a bit of a personality quiz nut, so I found taking the StrengthsFinder Assessment to be an enjoyable process, and my results lined up with what I would have predicted for myself after reading through each of the 34 strengths. The assessment identified Input as my top theme (“People who are especially talented in the Input theme have a craving to know more. Often they like to collect and archive all kinds of information.”) My other top four themes were Learner, Intellection, Discipline, and Focus, each of whose titles are fairly self explanatory. In other words, the assessment revealed that I have a knack for thinking, learning, and gathering information, and that I enjoy routine and structure and am able to stay on top of my priorities. While I already knew these things about myself, I found it helpful to have these strengths confirmed and consolidated in a way that can provide me with a more clear direction for how to maximize my unique personality. The goal of StrengthsFinder is not just to identify strengths, but to guide the user in further developing latent talents. So how am I choosing to implement these new-found self-realizations? My results indicated the fields of education and journalism as areas in which someone with my combination of strengths would excel, so it appears as though I’m already headed in a good direction! Though I don’t plan on going back to teaching full-time (at least not while we have kids at home), I intend to continue utilizing my strengths by teaching Sunday school and, eventually, homeschooling our children. I might also look into some form of adult education—either furthering my own learning, or possibly teaching adult classes of some type. (My experience with our childbirth classes has me open to the idea of becoming a childbirth educator.) As for the arrows pointing me toward working in journalism, I think I’m on the right track in keeping up this blog. I plan to continue writing here, and possibly pursuing other outlets for my writing such as guest posting on other blogs or becoming a contributing writer for a larger publication. I’m excited about these potential opportunities and feel encouraged and motivated by the validation provided by my StrengthsFinder results. 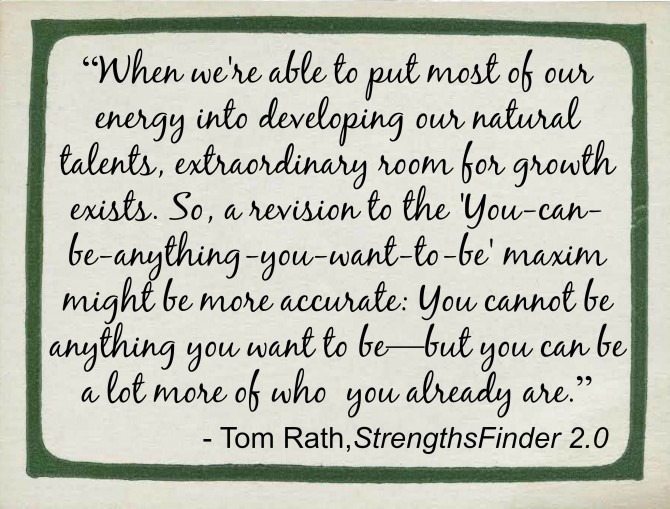 If you are looking for a bit of direction in your career, or would like to identify areas in your life that could benefit from some extra attention, I would highly recommend taking the StrengthsFInder Assessment and reading through StrengthsFInder 2.0. Like me, your results could confirm what you already know about yourself, or they might reveal some surprising areas of talent that are ready to excavated. Taking the test and sharing results is also a great way to connect with your spouse; Luke and I learned a lot about one another and are excited to help each other maximize our areas of talent. If you have already taken the assessment, I’d love to hear about your results and what you’re doing to build upon your personal strengths; please share you experience with me in the Comments! My Book Rating: 4.5 out of 5 stars.